The day after La Befana will always be the day we put down our beloved Vladimir, who had been gravely ill with intestinal cancer. Five years ago on a sunny January 7th, his time was up and my heart still cries a little. Vladimir, “so dignified and pure of heart” as our brother-in-law, Eddie, wrote, will be forever etched into my life and soul. Our beginnings here in Italy were made all the more wonderful with his presence. 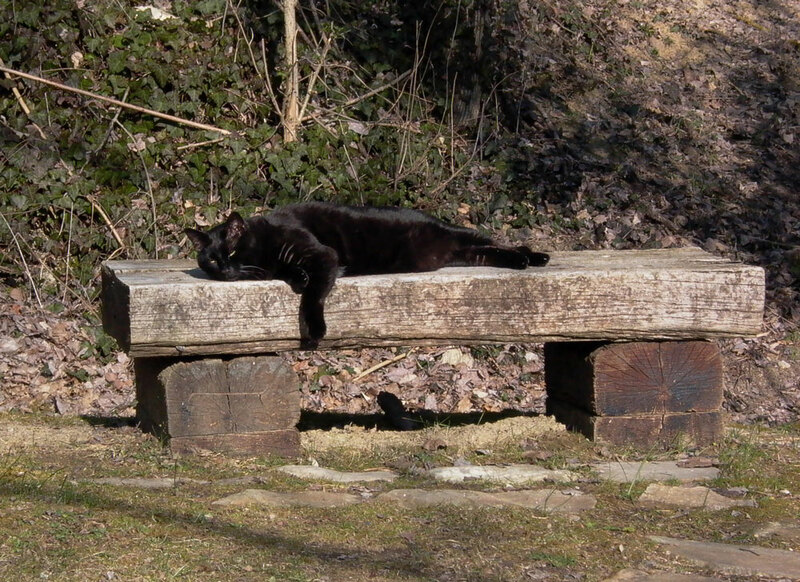 He spent the last few days of his life resting in the gardens, in the sunshine. He had stopped eating again, and this time we knew it was the end. The day before we put him down, I sat with him in the Japanese garden for an hour. We listened to the horses in the field, the sheep and their bells in the hills, and he watched the birds with his usual intensity. A large woodpecker landed near the bamboo, and he leaped off my lap. Even though he couldn’t eat and was down to nine pounds from twenty, his instinct as a great hunter flashed for another moment. He was poetry in motion and I momentarily forgot that he was about to die. The next day, when it was time to go, I found him in the lower meadow near the stream. I picked him up, his poor skinny body weighing nothing, and he draped himself on my shoulder. We walked all around the grounds, and I talked to him about the fields, the stream, the olive trees, the meadow, the lavender and rosemary, the bamboo and Japanese maples. I told him that all of “his nature” would miss his beautiful presence. He touched his nose to my lips, our secret kiss that we’d coveted for 12 years. It was time to go. Pavel and I didn’t talk on the way to the vet. What is there to say? You have to do this, and there’s no turning back. I held him while he was going under, Pavel at my side, both of us crying. The roller coaster of emotion had taken its last uphill climb. Our vet was amazing. Vladimir didn’t feel anything. He died peacefully. She cried with us. We remember all of his antics, his playing, his purrs in the night. He still kisses me in his secret way. But most of all, we see his beautiful eyes gazing directly at us—questioning, understanding, loving, and connecting as no other animal has ever done. Vladimir. So dignified and pure of heart. 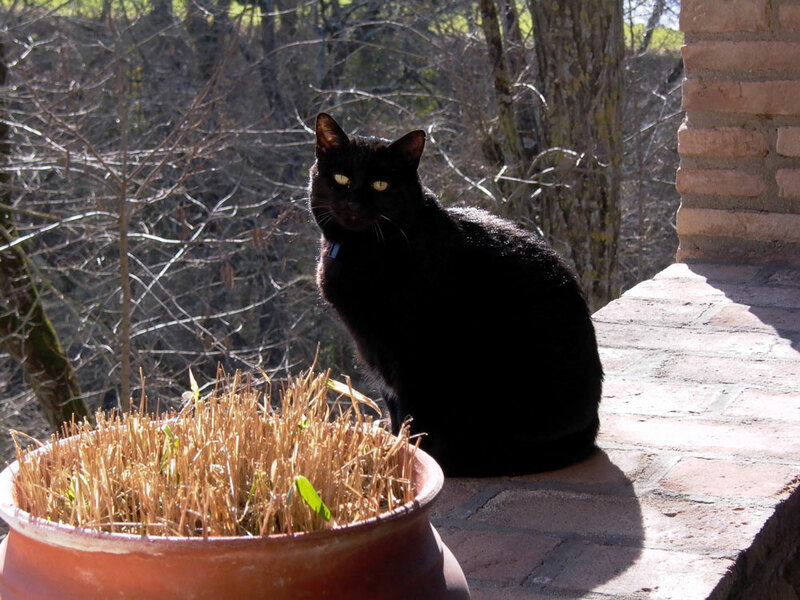 This entry was posted in Cat Tales and tagged cats, Field Stones of Umbria, gifts of life, Italian stories, La Befana, living in Italy, moments, postaday, Umbria. Bookmark the permalink. I know how you feel.My owl died last week. Oh I’m so sorry, Nigel. These critters really pull at our hearts. Even though they’re gone, aren’t we grateful that we did have them! My Tallullah has been gone for 4 years now and I still miss her, and sometimes expect her to be at the door to greet me as she always did. It is horrible when a pet dies. They stay with us for so long in our memories. Takes a lot to make me cry. But I am . . .
Every time I read this passage, I still cry. It helped alleviate the pain and disbelief immensely by being able to write…but sometimes, I swear, I am back in that lower meadow whispering to my boy.